Spring cleaning was a thing before Marie Kondo was all the rage. And I have some conflicting thoughts about clearing out clutter. Is more organization truly necessary? Are your current systems and methods actually outdated? Let’s look at the light and dark sides of “tidying up,” especially as they pertain to the creative processes in a writer’s life. When we can simplify something, it usually feels good, because we’ve found something within our grasp to improve — and we don’t have control over many other complex parts of life. For example, morning routines that prepare you for your day ahead and evening routines that let you wind down at night are tactics that can help you stay balanced during all of the unknown that occurs in between. And you can also have work guidelines in place that set you up to be focused and productive. The light side of tidying up is that you can optimize your chances of accomplishing both your small and large goals. When we think we aren’t already “doing enough,” it usually feels bad. It’s overwhelming, because the paths to make your desired changes aren’t always clear. You might want better clients, but you don’t know how to get them. You might want to charge higher fees, but you don’t know how to justify those prices. You might want to shorten your work hours, but you don’t know how to set boundaries with clients. Instead of taking action, you just get frustrated. The dark side of tidying up is the implication that something is wrong with your current conditions. Honoring where you are promotes productivity more than wishing you were already in a more advanced stage of your career. There is always room to get better, so the trick is to not get down on ourselves when we haven’t “fixed” a perceived problem yet. In terms of my own personal cleaning anxiety, I prefer when things are organized, so tidiness is always ideal. But until I have the time and/or energy to clean up, I’ve learned to accept when things are messy. It’s fine either way, so instead of getting overwhelmed or frustrated, I work with where I am to meet my goal. I chose the quote in the image for this post because of the story behind the song lyrics. Pete Seeger created “Turn! Turn! Turn!” and the Byrds recorded one of the most well-known versions of the tune. Both parties made interesting choices to not create completely new work and find the existing words that satisfied the emotions they wanted to express with music. Seeger could have second-guessed his choice to adapt from a Bible verse. The Byrds could have second-guessed their choice to record a song they didn’t compose. They could have chosen to not move forward, frustrated with their lack of originality and seeming need to “improve” their own skills before they shared their creations with the world. But artists learn to see when an idea is “good enough” — balancing the light and dark sides of the creative process. It’s a critical skill that helps you complete projects. Are you a professional writer who wants better clients and more recognition? The four-week content marketing strategy course, taught by Brian Clark and Sonia Simone, honors where you’re at while helping you grow into the writer you want to be. You’ll then have the chance to submit your own work for Certification. There are plenty of programs out there that will give you a badge for completing a few multiple-choice quizzes. This isn’t one. 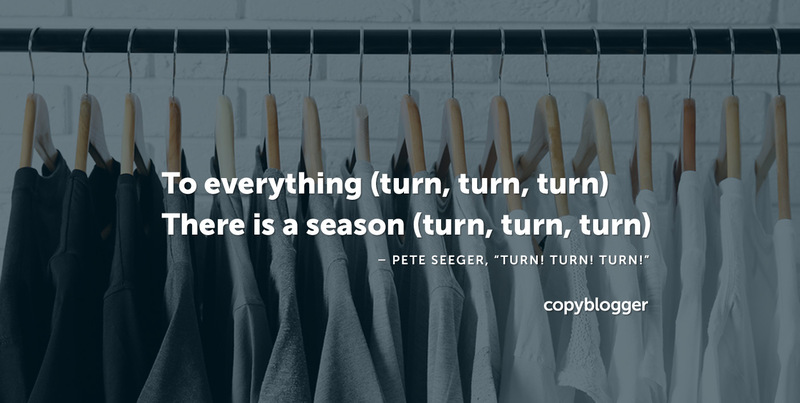 Each application is carefully reviewed by a member of the Copyblogger editorial team — and not everyone who applies will receive Certification. New students can only join the training course once or twice a year, so if you’d like to learn more when the program reopens, enter your email address below. Stefanie – I feel like this post was written just for me! As a content writer for a small company, sometimes I struggle with my two creative dark side buddies: “something better” and “more than.” After they visit, I’m left with pages of doodles and ideas that go in so many directions, I end up feeling depleted, discouraged and unable to move forward. Thanks for the idea of applying the”tidying up” concept to the creative process. Even if there’s nothing you can do about the party guests, there’s a lot of hope for grooming your creativity into a productivity machine. Hello Stefanie, I really enjoyed this article! I come from the literary backround (fiction and poetry). Thus, the concept of tidying up is like my old frenemy. I just started to become more interested in online marketing as selling books does not make much money unless you are very big (Is that a wrong motivation? I do not think so.) What is your advice for a beginner in this field? Is it possible to ‘write well’ if you do not know the niche? Is it neccessary to read up a lot about it in order to produce a high-quality content? What do you think? Thanks! Your literary background should come in handy when learning about creating content. Being both a writer and an editor I can relate to the dark and light side of tidying up. I always enjoy a better final product and sometimes it is easy but sometimes it isn’t pleasant getting there!